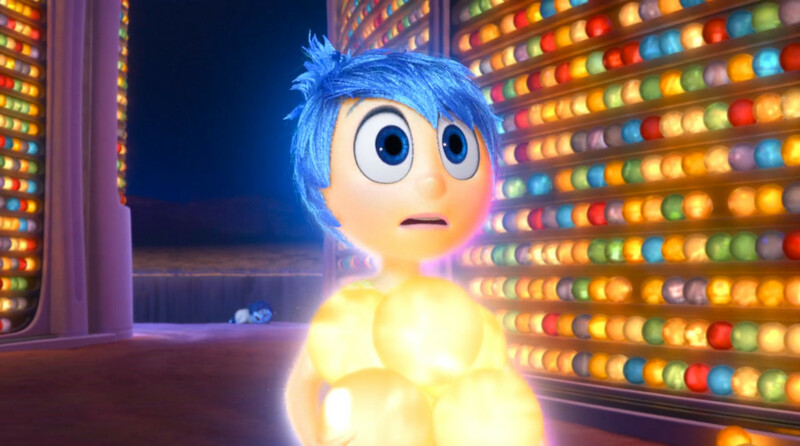 If you’re wondering whether Pixar’s newest movie Inside Out will make you cry, the answer is maybe. I know because I saw it a few days ago, thanks to Discount Tuesdays at the local movie theater and two very bored children (we’re on week two of summer vacation people, things are not looking good). I’m not a particularly weepy person save for the occasional down day, random reminders of my deceased mother in the grocery store, when I get all the way home before realizing I picked up the wrong carry out order, and when watching an especially rousing musical number. So you see, I only cry for the best most important reasons. Being the tough girl that I am, I didn’t think Inside Out would make me cry. I managed to hold strong for about 95% of the film, but there was this one part….well…I won’t spoil it for you, but it made me very sad. My 5-year-old noticed the tears running down my face and immediately notified her 8-year-old sister. Obviously, they were both horrified. For the remainder of the movie every time something even remotely sad happened my kids would sneak looks at me, making sure I had myself under control. So yes, you too may cry in front of your children and that’s okay. I typically don’t like writing about movies, but the message of Inside Out is so spot on for anyone who’s experienced a loss or gone through a tough transition that I almost feel like covering this movie is in my job description. Before our adult readers dismiss what I have to say, I want you to know this movie falls among a handful of movies that transcend what you typically expect from animated movies. On the surface these movies are made for children with their beautiful animation and funny characters, but on a deeper level they really effectively tackle themes and issues around growing up (Inside Out, Toy Story), death, loss, and grief (Up, Big Hero 6), and even existential themes (that’s you again, Toy Story). In doing this, they often allow grown-ups to see these concepts from a younger more innocent perspective in ways that are thought-provoking, disarming, and profound. I’m horrible at summaries and synopses (that’s the plural of ‘synopsis’, I looked it up), but I want to convey to you why this movie is great for children who’ve experienced losses of any kind. I’ll try not to include many spoilers but proceed with caution if you want to see the movie with completely fresh eyes. Even adults can struggle to name their emotions from time to time. In my experience, children are seldom cognizant of the ebb and flow of their feelings or the idea that they have many different emotions rattling around in their cute little brains. Inside Out is essentially told from the perspective of the main character 11-year-old Riley’s emotions who are personified as the characters Joy, Fear, Sadness, Anger, and Disgust. Of course humans experience a broader range of emotions than just these five, anyone who’s been through grief can attest to that. The director and his team had to identify a few key emotional players so they called in an expert psychologist, Paul Ekman, who helped them hone in on their main characters. These characters represent 5 of the 7 emotions which Ekman says have universal facial signs (the two they excluded were surprise and contempt). Despite an incomplete line-up of emotions, the movie, which depicts the emotions interacting with one another from a control center in Riley’s mind, helps to frame the emotional juggling act that occurs inside our brains and how emotions can influence our perceptions, actions, and reactions. This is an actual plot line, not some abstract concept that grown-ups pick up on if they’re paying attention. For the majority of Riley’s life, the emotion Joy has been in the driver’s seat. As she grows older and moves away from her childhood home, to the horror of all the other emotions Sad starts coloring some of her memories. Everyone wants Riley to be happy, even Sad, and the emotions all believe they need to protect her from sadness and pain at all costs. So, as they always have in the past, the emotions look to Joy to save the day. You know the type of person who is always telling you to “be positive!” and “look on the bright side!”? This is the person who is really uncomfortable with things like tears and sorrow and they believe it’s personally their job to take away your pain. Well, that’s Joy and everywhere you look she’s there chasing Sad away. But Joy isn’t able to control things in the way she has in the past and throughout the movie Joy, along with the audience, has to learn that it’s not only okay to feel sad, but sometimes its an important and necessary part of being able to feel joy. P.S. – For those of you who’ve ever had someone try to comfort you in your grief by minimizing your sadness or by suggesting you find the positive, there’s a scene in here you’re going to love. That’s all I’m going to say, let me know what you think after you’ve seen it. P.P.S. – In part of the movie both Joy and Sad leave the control center of Riley’s brain and so she can only feel fear, anger, and disgust. I love that they depicted how disconnected, isolated and confused someone can feel due to the absence of certain emotions. This could be an interesting conversational starting point for any child impacted by depression. A main crux of this movie is how emotions impact Riley’s memories. Memories are represented by colored balls and the balls are colored depending on the memory. So a happy memory is yellow, a sad memory is blue, a disgusting memory is green, you get the picture. Throughout Riley’s childhood, most of her memories appear to be happy, but then she has to move and say goodbye to her friends and her home and many of the memories turn blue. This is one of the movie’s most poignant details for children who have experienced a death or other type of loss. One of the most difficult things about losing someone we love is that happy memories we shared with that person become colored with a tinge of sadness. Joyful memories are still happy, but they also become a little painful because the person is gone. The depiction of happy memories becoming a little blue is one that children impacted by loss may be able to relate to. Conversely, the movie also teaches us that moments which start out a little sad can have positive value in that they lead to moments of love and support, lessons learned, and personal growth. One of the final memories Riley makes in the movie is a mix of both blue and yellow and finally the characters were all able to see the inherent okayness of this. Emotions are really tricky; they defy definition, there’s no consensus on how many there even are, and they constantly change. Also, as adults it’s difficult to remember how our emotions were felt or understood when we were children. 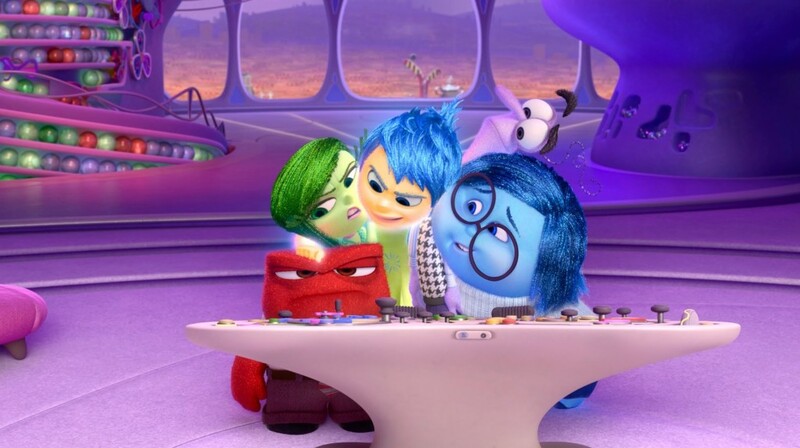 Inside Out simplifies this concept and illustrates emotions in a way that makes it really easy for us to talk to kids about their feelings and how their feelings might influence their behavior. Children won’t always pick up on the more complex and subtle messages of a movie so it’s always helpful for adults to make the most of these teachable moments. Although afterwards it was easy for my children to identify who drives their emotions in different scenarios, when I asked my older daughter why might someone’s memories be both happy and sad she seemed a little unsure. I had to offer the example of my own memories of my mother being both happy because I love her and sad because she’s gone in order for Evelyn to have a little a ha! moment. We wrote a post a while back on making the most of teachable moments in different Disney movies, you may want to check it out.